Veggie-stuffed recipes are a vehicle for lots of veggies and protein, plus stuffed recipes are full of comfort and satisfaction. 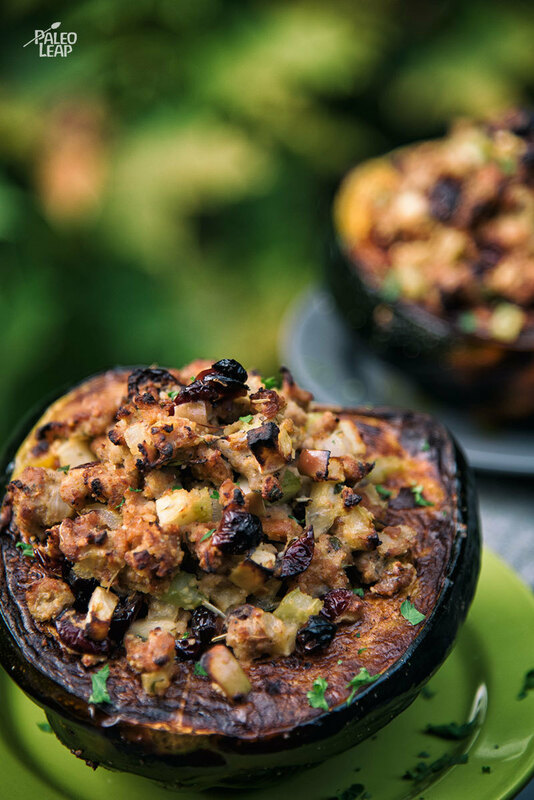 The “stuffed” portion of this recipe fills up an acorn squash, however the filling is similar to that of a Paleo stuffing recipe. Today, traditional holiday “stuffing” refers to a dish with pieces of bread, however it can be argued that grain-free, bread-free stuffing is more traditional and an even more delicious alternative. 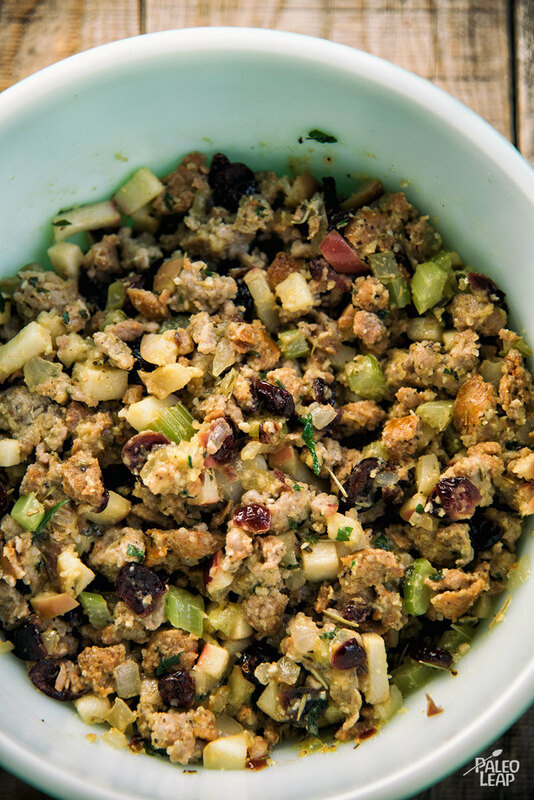 The stuffing in the squash is sweetened with apples and dried cranberries, and made savory with onions, garlic and celery. The cooked squash offers a creamy, soft starch that replaces the bread. This recipe includes dried cranberries. Look for cranberries that don’t have added sugar or “concentrated fruit juice”. Enjoy this as a complete meal, or add a pureed soup on the side! Place the squash halves open side down on a baking sheet and bake for 15 to 20 minutes or until the flesh is soft. Brown the pork sausages in the skillet, breaking apart as they’re cooking. Place the cooked pork sausages in a big bowl. Add the onion, celery, apple, and garlic to the skillet, cook for 2 to 3 minutes, then add to the bowl with the pork. Add the spices, cranberries and beaten egg to the bowl with the pork. Season to taste. Stir in the almond meal and whisk until everything is well combined. Fill each squash cavity with the pork sausage mixture and place in the oven. Bake for another 15 to 20 minutes. Let cool for about 5 minutes and serve.